Looking for a special Halloween gift? This listing is for ONE embroidered Free Standing Lace bookmark. 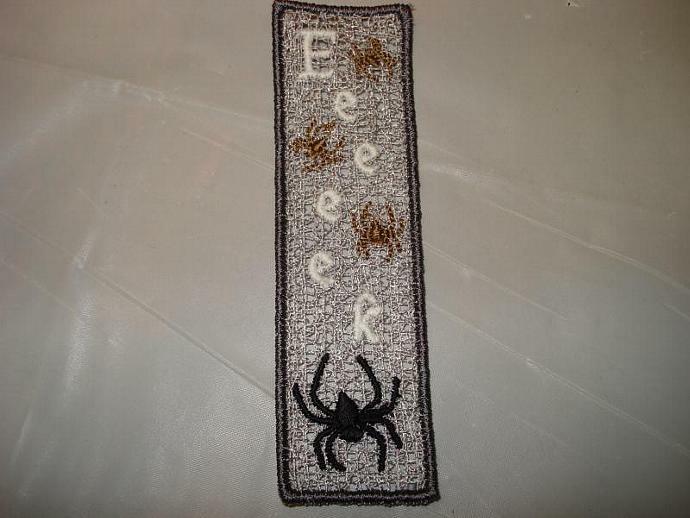 This specific book mark is the "Eeeeek" with silver/grey net background, glow-in-the-dark words, small brown spiders, large black spider and dark grey edging. This Halloween bookmark is frightfully fun! Perfect to have on hand to slip into a card for an extra little surprise, to hand out to trick-or-treaters, or as classroom favors. Contact me for bulk pricing.